Imagine having to flee your country, cope with your parent’s death, and ignore a marriage engagement. For Sister Therese Fang, OSF this is her story. Sister Therese was born on November 27, 1920 in Shan Tung, Tung Ping, China. Although she didn’t have any siblings she played with her cousins who lived nearby. Their houses were situated around a church and the families attended daily Mass in this predominately Catholic village. When she was 13, she was told that she would soon marry a boy from her village - he and his family lived in the area and were family friends. “I cried because I didn’t want to get married,” Sister Therese said. Her mother insisted she wait until she was 21 for marriage. Her parish priest respected the wishes and encouraged Sister Therese to work at St. Joseph Hospital in Tsinanfu, 100 miles away. There she met the Hospital Sisters and assisted in the dining room reserved for doctors and priests. Although she was engaged and did not discuss it with any of the Sisters, she actually began considering religious life. The marriage pressures were increasing. “One day I accidentally broke a dish and was afraid I’d be punished,” Sister Therese said. So she put the pieces in her apron pocket and apologized to Sister Clementia Dasenbrock, Superior, (a native of Lillyville, IL). “I cried for forgiveness and asked if I could become a Sister,” she added, although she still did not mention her engagement. Shortly after, her mother gave birth to a second child but both died. Tragedy followed one year later when her father died of pneumonia. Her fiancé’s family insisted that the marriage be scheduled and traveled to Tsinanfu. “I heard they were looking for me and I was so afraid. I didn’t know what to do so I decided to cut my hair in hopes they wouldn’t recognize me,” she explained. With her fiancé’s family waiting by the church, she entered the church with some people and thankfully wasn’t recognized. She never turned back and never mentioned the engagement again. 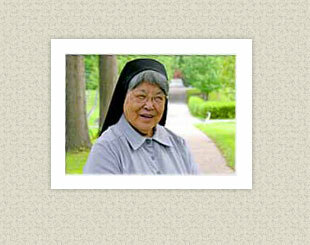 Sister Therese continued to live and work at St. Joseph Hospital and finished high school. In the summer, she worked in the x-ray and lab and found happiness. “The Sisters wore white and looked like angels as they cared for the patients. I wanted to have that experience,” she said and entered the Congregation in March 1944. She, like so many of the Chinese Sisters, entered religious life in hope of serving the Chinese people in need. At the same time, fear of the Communists was increasing as they were invading cities around Tsinanfu. “We were so afraid because the Communists killed people and caused so much suffering,” she recalled. Sister Clementia evacuated the Sisters and told them they were going to safety in America for three years. “We had to leave immediately and didn’t have a chance to say good bye to our family,” she said. With tears in her eyes, Sister Therese traveled to America – a country that she and the other 23 Chinese Sisters knew nothing about. Now in Springfield, Sister Therese began learning English, eating new foods, and studying nursing. She professed Final Vows in 1951 while wondering if any of her family had survived the Communist invasion. The first Christmas at the Motherhouse was unforgettable to Sister Therese. “I thought I was in heaven as I heard the Sisters sing on Christmas in the church,” she recalled. She too shared her musical abilities as a member of the choir and organist. Sister Therese later graduated from St. John’s School of X-ray Technology and became a registered radiological technician. Her assignments took her to their sponsored hospitals in Sheboygan, Springfield, Chippewa Falls, and Litchfield. After 33 years of no contact with her family, Sister Therese and two other Sisters traveled to China. They were happy to be reunited with some of their families but saddened to hear of the suffering inflicted by the Communists. As for her engagement, it was never discussed. Living in America has offered Sister Therese many wonderful opportunities. But one thing stands out…St. Louis Cardinals and catcher Darrell Porter. She smiles as she speaks of Darrell and shares a photograph from 1982 – the year he was named MVP of the World Series. Her family has been blessed with many vocations. She has seven priests in her family: one great-great uncle, two great uncles and four cousins. In addition, two of her cousins are Sisters. “All of these people, and so many others, have prayed for and supported me over the years. Without them I might have left the convent and without them I would not have survived,” Sister Therese said. She has endured many hardships and hopes that her story can be an inspiration. “I believe that if you have faith you can endure everything,” Sister Therese concluded.